Related Searches: Is What Google Understand of Me? When comparing few sites with similar content about pregnancy I found the SERPs on few broad keywords totally ignoring some of them. While few are on first or second page, the others are positioned after the fifth page and the better positioned results (on third or fourth page) are, from a human point of view, not so relevant to that search. Note: my English is really basic, don’t get irritated by grammar errors on this article. Thank you. I was not looking at the search results, I know all those sites, and many others I checked, have really compelling content about breast feeding and I know they are written by professionals. I looked at the related search offered by Google: are they similar or different? Why for a site Google should suggest me different (sometime really different) related searches. Is that what Google understand of a site related to a specific topic. As you can see the last site has the word “richiesta” (by request) suggested on 5 suggested searches over 8. “breast feeding by request” is a specific sub-topic of “breast feeding”. It sounds like the last site is known by Google to give specific answers on that particular sub-topic while the other two seem to be known by Google as a more broad source of information for “breast feeding”. Another clearer case can be seen repeating the experiment with “acido folico” (folic acid). That is an dietary supplement suggested during the first pregnancy month to reduce the risk of spina bifida (yes, it sounds Italian, I think it is Latin). As you can see the first site has generic and broad suggests, the second one is clearly “connected” to pregnancy while the last one seems connected to the “menstrual cycle”. Let me reveal that a pregnancy-oriented site talks about folic acid in relation to the pregnancy and the importance of those supplement on first months. 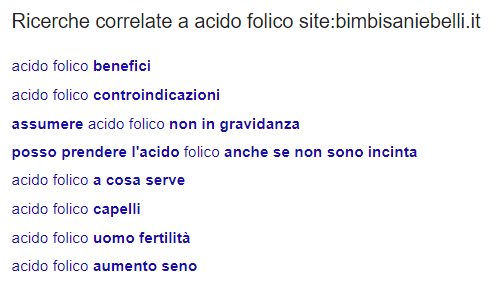 Now if you try to give more context to the search using “acido folico gravidanza” (folic acid pregnancy), the shows nostrofiglio.it on first page, bibmisaniebelli.it on the second page, periodofertile.it not on top 50. Please criticize that experiment and let me know your opinion! Disclosure: I’m a tech consultant of periodofertile.it and this was just a Saturday morning experiment waiting my children to wake up for breakfast. That site has a forum which generates a lot of contents by participants and those contents could have “polarized” the knowledge Google has built about that site on few specific topics.